The photography is so muted, the colors so washed out, that the movie not only feels like it takes place in the 1970s but was filmed in the 1970s. Max is a rambunctious kid, possibly friendless, living with a teenaged sister and a divorced mom (Catherine Keener). When friends come to pick up his sister, he attacks them with snowballs and then gleefully runs back to his newly made snow fort. But they’re wild things, too, and bigger, and they follow and collapse the fort, leaving Max tearful—probably less physically hurt than emotionally hurt, because his sister watched the destruction and did nothing. In revenge, he runs into her room, stomps the snow off his body, rips up gifts he’s made for her. Anger spent, regret sets in. This cycle of creation-destruction-regret continues throughout the movie. We see him briefly at school. His science teacher is offhandedly explaining that the sun is a fuel source, and, like all fuel sources, will eventually expend itself and everything in our solar system will die. Attempting to cover up this awful fact, he digs himself in deeper: He talks up the ways mankind will destroy itself before then. More creation-destruction-regret cycles. More callbacks to the 1970s. Back then, in the midst of my own parents’ divorce, it seemed I was surrounded by destruction scenarios, and one in particular stuck with me: an “In the News” program (sponsored by Kellogg’s) shown between Saturday-morning cartoons, which reported that a graduate student wrote his doctoral dissertation on how to build an atom bomb. The meta-message: If one individual can do it, what country, with many individuals at its disposal, can’t? The knowledge was out there and couldn’t be bottled up. It made you feel small and powerless. It made you cling to fantasies of being all-powerful. On the island, events unfold that, one imagines, mirror events in Max’s real world. 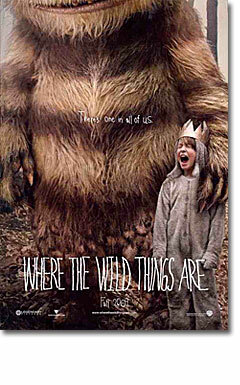 Carol (James Gandolfini), a defacto leader of the Wild Things, and both father and buddy to Max, is estranged from KW (Lauren Ambrose), who’s off with Bob and Terry. “What about loneliness?” Carol asks Max during his coronation. “Will you keep out the sadness?” So even in Max’s fantasy there’s an immediate sense that things are not whole. But in the midst of their “wild rumpus,” as they run, jump, howl at the moon, KW returns, and they all hogpile together and sleep together, rather than in the separate cocoons (literal and metaphoric) that Carol was smashing earlier. “We forgot how to have fun,” Carol says as they drift off to sleep.